Use indoors or out... Use to hang swags across windows or as decorative door toppers. 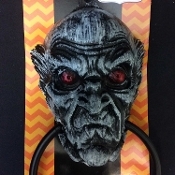 Creepy red eyes, dimensional spooky Marley Style Monster head has a hole for hanging. Includes swinging knocker ring with white-washed black and gray color scheme. Sturdy hard heavyweight hollow back plastic Head measures approx. 6.5-inch (16.25cm) without Hang-hole x 5-inch (12.5cm) wide. Hoop approx. 6-inches diameter, with functional metal ball bearing in back to make knocking sound on Door. Total approx. 11.5-inch (28.75cm) Long including round handle hanger ring. Ribbon or Banner Hanger, Hand Towel Ring, Drapery Garland Swag or Scarf Holder, Costume Jewelry Necklace Display, Guest Bathroom Door Knocker, Teenager Bedroom Decor... For decorative purposes only, but knocker is fairly durable and really works! Fresh Decor from a Creepy Haunted House! Goes anywhere... Great to display in entry or hallway!